The term “Organic” means different things to different people. 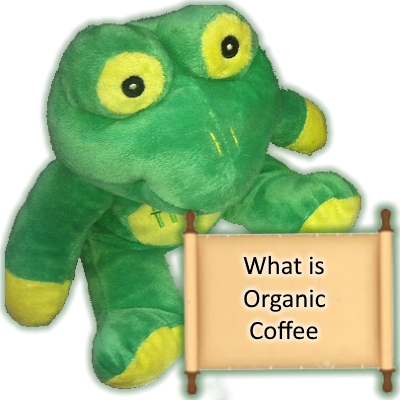 The basic concept of organic coffee should be about sustainability, both for the earth and humanity. Wild: This means that the coffee is not generally grown with human intervention. Instead it grows wild (normally in a forest or some naturally shaded area). Since all produce at one time did grow wild, each crop has its own wild place of origin. For Arabica coffee this is the forests grow between Southern Sudan and Ethiopia. Organic in conversion This normally means that the produce is produced on a farm or area that was not organically certified before, but is on the road to being organically certified. Certified Organic This is where it gets in to the who and what. Namely which board or organisation certified who, and by what methodology. The importance here is what is the approach by the body to certification. Essentially certified organic, or organically certified could be all of the above, or more than that. Each certification body has their own set of check boxes a producer needs to satisfy. Some of these are purely about what goes into growing, some include what goes into producing, some consider the whole value chain. Each certification is different. We will list a few below. From the UTZ.org website: “When you see the UTZ logo on a product, this means the company supports sustainable farming by sourcing UTZ certified coffee, cocoa, tea or hazelnuts. From the Rainforest alliance web site: “Our little green frog really gets around–and that’s good news for people and the planet. These days, you can find the Rainforest Alliance Certified seal on a rapidly growing list of products and services, including coffee, chocolate, tea, fruit, flowers, paper, furniture and tourism lodges.